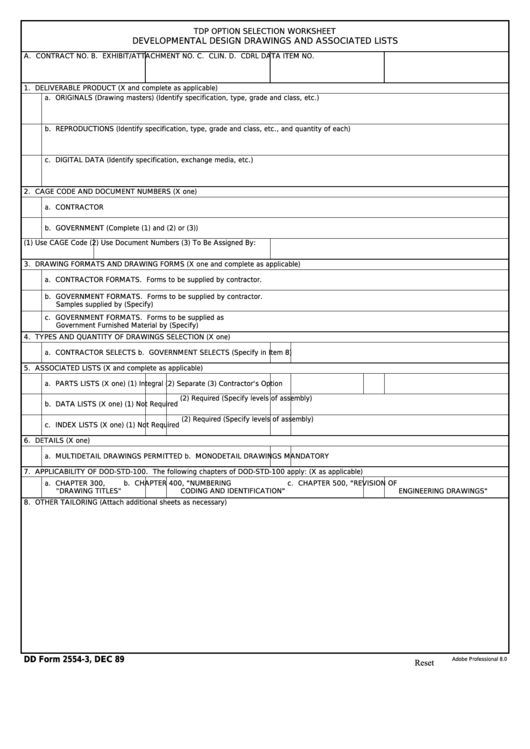 Download a blank fillable Dd Form 2554-3 - Tdp Option Selection Worksheet Developmental Design Drawings And Associated Lists in PDF format just by clicking the "DOWNLOAD PDF" button. Complete Dd Form 2554-3 - Tdp Option Selection Worksheet Developmental Design Drawings And Associated Lists with your personal data - all interactive fields are highlighted in places where you should type, access drop-down lists or select multiple-choice options. a. CONTRACTOR FORMATS. Forms to be supplied by contractor. b. GOVERNMENT FORMATS. Forms to be supplied by contractor.